Abortion has ended more lives than the world wars and the Holocaust combined. We see those images, and say to ourselves, "Never again." 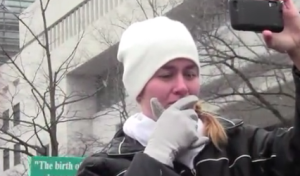 What if the world could see exactly what happens in a real abortion process? Tomorrow in Washington D.C., they will. Created Equal, a national pro life group, will be displaying abortions in progress on a Jumbo-Tron TV screen at the Lincoln Memorial on July 14, as part of a week-long Justice Ride event. The idea is to tell in images the hard truth about what abortion is and does. The group created the video a few years ago and has shown it at other events, including the DC March for Life and West Coast Walk for Life. "Traditionally at these events, the politicians, activists, and post-abortive parents are given a voice. Not until recently have the babies been represented in such a profound way. Using this powerful technology allows us to continue to stand for the victims at these events," says Created Equal via its website. The Lincoln Memorial is known, among other things, as the location for the famous "I Have Dream" speech delivered by the late Dr. Martin Luther King, Jr. in which he restated our Founders' words that "all men are created equal." Warning: This video contains graphic images.